As you may know, I occasionally host a guest blogger or two on The Ginger Cook. Usually this just happens to be a member of my family, but I'm opening to having anyone! Friends? Want to post? As long as I deem your picture as worthy, you may have a shot. A little bit of background information before I leave this post in the hands of my Dad. A few months ago my dad bought my Mom a standmixer for "her birthday." I say this in quotations because she neither waited to get it on her birthday nor is she the one who primarily uses it. In tandem with the mixer, I bought her a 1973 vintage copy of one of my favorite bread books, The Tassajara Bread Book. Why should the City by the Bay get all the glory when it comes to sourdough? I’m here to claim some of the glory for the chilly state of Michigan. In this guest Ginger Cook post, “I” am Katherine’s dad, Ed. Lest you fear that I’m diluting the ginger-ness of this blog, rest assured that I’m a redhead as well. Regular readers may wonder why I’m calling this bread recipe Kalamazoo Sourdough, since Katherine is from Brighton, about 2 hours from K-town. There are three reasons for this. First, “Kalamazoo” just has a ring to it, much more so than “Brighton”. Second, our other daughter Caroline is attending college in Kalamazoo at Western Michigan University. Finally, Kalamazoo is home to Bell’s Brewery, one of the best craft brewers in the country and the source of a vital ingredient for this recipe. This recipe was written assuming that you are using a baking stone or pizza stone. A Dutch oven will also work very well, however it is harder to get the loaves into a hot Dutch oven, so I prefer the pizza stone. If you use a Dutch oven, you don’t need the Pyrex baking dish, since the moisture from the dough will create steam in the Dutch oven. The steam is the secret to a perfect crust. Mix sourdough starter with water in a large bowl and whisk vigorously until thoroughly mixed. If using yeast, add it to the liquid and whisk some more. Add salt and whisk into liquid. Add flour to water and using a rubber spatula, fold in flour until water is absorbed, then add beer and fold some more. You should have a shaggy ball of dough. If needed, add water a couple of tablespoons at a time until dough reaches the proper consistency. Cover bowl with plastic wrap and let sit for 10 hours or more, until the ball has roughly doubled in size. Place bowl in refrigerator and let sit for an additional 6 to 8 hours. Cut parchment paper to fit onto a baking stone or into a Dutch oven. Remove dough from refrigerator and knead about 15 times. Shape into a large loaf, or if a smaller loaf is desired, divide and shape into two loaves. 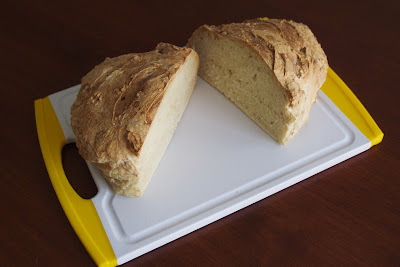 Place the loaf or loaves onto parchment paper and spray surface of loaf with olive oil (use a mister). Cover loosely with plastic and let rise at room temperature until doubled in size, about 2 or 3 hours. 30 minutes before baking, adjust upper oven rack to lower middle position and place baking stone on rack. Place a Pyrex baking dish half full of water on the lower rack to create steam in the oven. Set oven temperature to 425 degrees F and let temperature stabilize for 30 minutes. Slash top of loaf with a sharp knife, remove baking stone from the oven, and place parchment paper onto baking stone. Immediately place into oven. Bake for 45 minutes or until internal temperature of the bread reaches 205 to 210 degrees F (a digital thermometer is helpful here). Remove bread from oven and allow to cool on a mesh rack for 10 to 15 minutes before enjoying.